Be prepared to deal with extremely fast car racing on hard tracks. Use your skill to drive on best lines to gain maximum performance. Dominate in all maps and build ultimate machine for raw races. 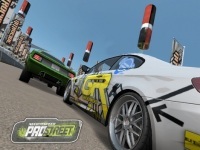 Need for Speed: ProStreet come as the seventh NFS series on May 2007 published by Electronic Arts. Show the world that you can be the next street king by eliminating all other racers. In the demo version, you will face a long straight street that requires optimum speed. Control your car tightly and don't let it goes out of the road.